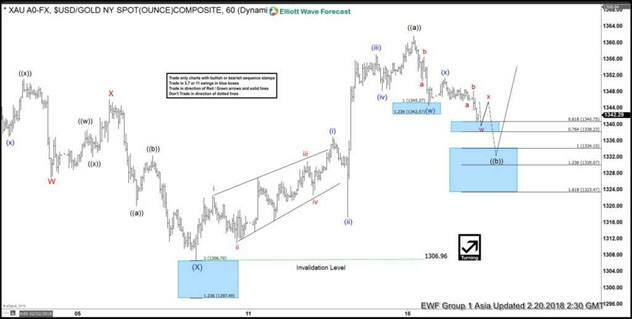 Gold Short Term Elliott Wave view suggests that Intermediate wave (X) ended with the decline to 1306.96. 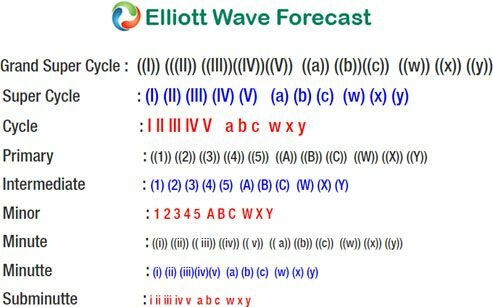 Up from there, the yellow metal is rallying in 5 waves impulse Elliott Wave structure where Minutte wave (i) ended at 1337, Minutte wave (ii) ended at 1317.27, Minutte wave (iii) ended at 1357.12, Minutte wave (iv) ended at 1348.30, and Minutte wave (v) ended at 1361.72. The 5 waves rally from 1306.96 to 1361.72 ended a higher degree Minute wave ((a)) of a zigzag Elliott Wave Structure. Minute wave ((b)) is currently in progress to correct cycle from 2/8 low in 3, 7, or 11 swing. The next extreme area in 7 swing comes at 1330.07 – 1334.15 where Minute wave ((b)) can end. Afterwards, as far as pivot at 2/8 low (1306.96) stays intact, expect Gold to extend higher. We don’t like selling Gold and expect buyers to appear at 1330.07 – 1334.15 area for a 3 waves bounce at least.